In the last few weeks, I have received some inquiries on how I get my snow to look white. With my latest assignment dealing with the color, White, I thought this would be a good time to write about snow photography. Camera light meters are designed to expose for middle gray. If you are surprised by this fact, this will go a long way in explaining why you are getting gray snow and not white snow in your photographs. By the way, this tip works for white sandy beaches or any landscape or object which is predominately white in color. A couple of years ago I went out early one morning to photograph the first snowfall of the season. I stopped by my favorite tree in a field and started composing. Here is one of the first shots from that day. 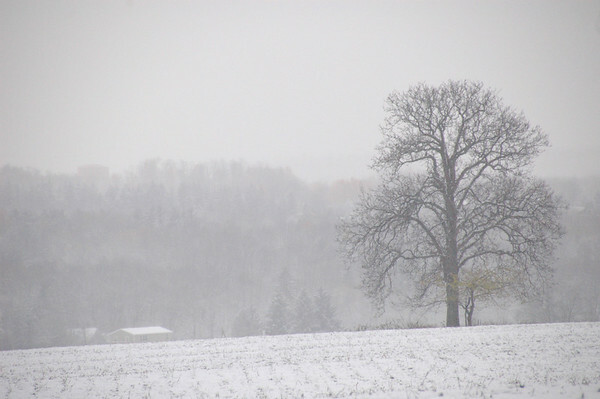 Tree in a field of gray snow. Ugh…after a few minutes, I checked the photos in my camera’s LCD screen and got some pretty gray snow landscapes. You see, my meter was doing exactly what Nikon’s engineers had told it to do. When faced with a large white subject, it meters a middle gray color. I can not be mad at my camera for doing its job as programmed. Luckily, we are much smarter than a light meter in a camera. To properly expose for snow, you have to allow more light through the lens to compensate for the camera’s meter. You can do this a couple of ways. First, you can manually change the aperture or shutter speed (but not both). You do this by using Aperture priority mode to open up one or two f-stops (smaller aperture numbers) or using a slower shutter speed in Shutter priority mode like moving from 1/250th of a second to 1/125th (+1 stop) or 1/60th (+2 stops). The second and much easier way is to use your camera’s Exposure Compensation adjustment button (or dial) to “dial in” added exposure of +1 or +2. If you don’t know where your Exposure Compensation, or EV, button is, check your camera’s manual for its location. You know where the manual is, right? It’s the book still in the box your camera came in. 🙂 Just kidding! Here’s the same scene after I changed the EV on the camera from +0.0 to +2.0. Tree in a field of white snow. Big difference, eh? This can be kind of unsettling at first. If you look at the LCD on the “blinky” or histogram screens, you will see you have drastically overexposed the shot. Don’t worry, when you pull it into your favorite photo editor, all will look just fine. You might have to adjust a few hot spots. This tip is mostly for those of you who use digital SLR or advanced Point & Shoot (P&S) cameras where you can control aperture, shutter speed and exposure compensation (EV). For those with P&S cameras, look for a mode or scene setting for snow and/or beach scenes. Those should work to make your snow white again. Remember, each camera is different so go out and experiment. 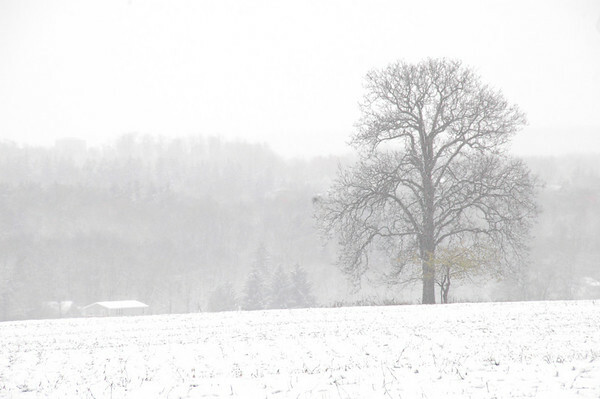 Find yourself a snow covered scene and put your camera in aperture or shutter priority mode and start with an EV of 0. Take a shot, change the EV to +1.0, +2.0 and then +3.0 and see which one looks best. That way the next time you have a beautiful snow scene or white tropical beach in front of you, you will know what to do. If you have any other tips for photographing snow or other white scenes, leave me a comment. If you wish to share your “white” masterpieces, check out the photography assignment post on this blog. This entry was posted in Photography and tagged camera, dslr, exposure compensation, how to, meter, nikon, snow, tip, tree, white. Bookmark the permalink. This seemed to have worked great for the above photo, but I had the hardest time when I took pictures of my kids in the snow. When the kids were exposed properly, the snow was gray, and when I got the snow to look white, the kids were overexposed.I just couldn’t get it right. So I opted for gray snow and tried to fix it in my editing program. Hmmm…usually when I get the snow right, the rest fall into place or close enough that I can balance it out in post. I also learned that on a bright day, you can meter off the sky as well. You just have to ignore the meter when it goes crazy as you recompose the shot. I bet you studied under Bryan Peterson. 🙂 Manual mode is not to be feared! If it looks gray, Gerry, than I agree with you. Most of the time, I see white and have to adjust my camera to make sure it sees white, too. I agree with Gerry. I love it when the snow looks gray and heavy and not all white & shiny. I love it when the snow looks blue–which it does, often. It’s easy to lighten up the snow in the software programs, too, but then you wouldn’t get to linger with the gray heavy feel of the wet dark early-winter day. Or you wouldn’t get to admire the long blue shadows beneath the deep woods. I have also learned to like white snow, too, but only when the sky is blue and it really looks white. Just my thoughts! Great reminder or mindful photography tips, Scott. I either shoot AV priority or use Manual playing around with that. I have used Exposure Compensation but haven’t for a good while…. I forgot! LOL Yes, a very good way to wash out the gray. Well, the next good snow I’ll work with the EV. Great post.